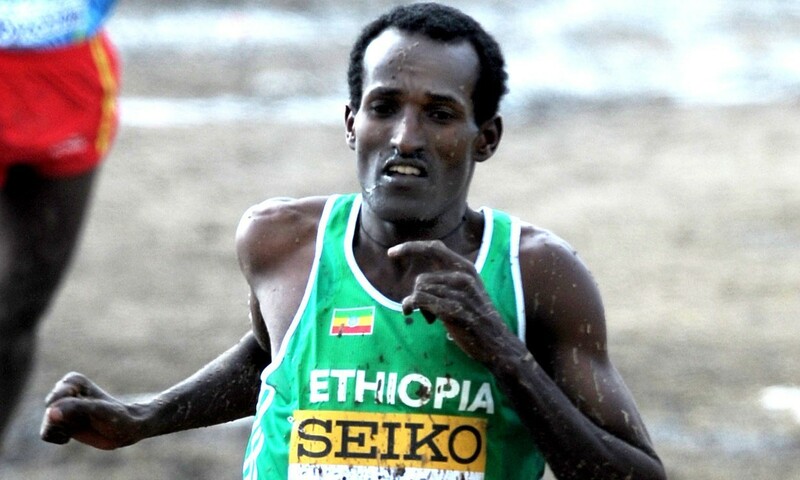 Ethiopia’s 2011 world cross-country champion Imane Merga won the 59th edition of the classic Campaccio cross-country race, the first IAAF Cross Country Permit competition of the year. He clocked 28:50 for 10km to win just ahead of his countryman and world junior cross-country champion Yasin Haji who was given the same time. Kenyan steeplechase star Jairus Birech was third in 28:54. Kenya’s Olympic 5000m medalist Thomas Longosiwa was fourth in 29:03, while the top European was Italy’s Stefano La Rosa with 29:29 for seventh. Once place behind was European junior cross-country champion Yemaneberhan Crippa, who on his senior debut clocked 29:30. Kenya’s African Games winner Alice Aprot dominated the women’s 6km event in 18:56 to break the course record ahead of Bahraini steeplechaser Ruth Jebet with 19:01 and former track world champion Linet Masai of Kenya with 19:02. Kenya’s world 2013 medalist Mercy Cherono finished fourth in 19:19, still clearly ahead of best Ethiopian, another steeple specialist Sofia Assefa with 19:30. Best Europeans home were Italy’s Veronica Inglese in seventh (19:59) and Briton Lily Partridge in eighth (20:09). Report with the help from Alberto Stretti. Nearly all the male title defenders from Sopot 2014 are set to try to fight for their titles in 2016 at the IAAF World Indoor Championships in Portland. An exception is triple jump champion Lyukman Adams from Russia who cannot compete due to the international ban on Russian athletes. Some will have it tough through the qualification process (Richard Kilty at 60m, Omo Osaghae at 60m hurdles or Ryan Whiting in shot put). For some it is clearer, like for Ashton Eaton, who has been invited by the IAAF for heptathlon, or athletes without any top opponents in their home countries (Pavel Maslak at 400m, Ayanlah Souleiman at 1500m, Mutaz Essa Barshim in high jump, Kostadinos Filippidis in pole vault). More difficult is the situation on the women’s side. Russians Mariya Kuchina (high jump) and Yekaterina Koneva (triple jump) cannot defend their titles. Still undecided about the competition are Shelly-Ann Fraser-Pryce (60m), Francena McCorory (400m) and Valerie Adams (shot put). Nadine Broersen is invited for pentathlon and it seems all is clear in regard to selection also for Abeba Aregawi (1500m) and Genzebe Dibaba (3000m), with Yarisley Silva (pole vault) and Kamila Licwinko (high jump) all having ambitions in the indoor season 2016. French long jumper Eloyse Lesueur plans only to contest sprints during the coming indoor season. Nia Ali (60m hurdles) has tough qualification ahead of her but she is back and Chanelle Price (800m) has decided to skip the indoor season. The best multi-day competition of 2015 was the Beijing IAAF World Championships ahead of the US Championships and PanAm Games, based on All-Athletics.com rankings. There are another seven categories of competitions in which the website prepares rankings. In one-day meetings the top three of the year are Monaco, Eugene and Paris. In indoor events, the European Indoor Championships in Prague is top ahead of meetings in Birmingham and Stockholm. In the combined events, World Championships leads ahead of Gotzis and Prague European Indoors, while in race walking, the European Cup in Murcia, Russian Winter National Championships and meet of La Coruna are in the top three. In special competitions (indoor and outdoor) the throwing meet in Cetniewo, Poland, leads ahead of indoor Pedros Cup in Lodz and the Slovak Banska Bystrica high jump indoor meet. London is the best in the marathons category ahead of Dubai and Tokyo. In the road races section three half-marathons lead with New Delhi, Ras Al Khaimah and Luanda. Three world champions will contest the pole vault at the PSD Bank Meeting in Dusseldorf on February 3 – current world champion Shawn Barber of Canada, current world indoor champion Kostadinos Filippidis of Greece and 2013 world champion Raphael Holzdeppe of Germany. The meet record of 5.90m by Bjorn Otto from 2013 will be under threat, particularly as Barber has already started his indoor season and has cleared 5.88m. Holzdeppe will open on January 16 in Merzig and Filippidis on January 23 in Rouen, where Barber is also scheduled to jump. Trayvon Bromell, Meseret Defar and Brenda Martinez have been confirmed for the New Balance Indoor Grand Prix. The event, which is part of the new IAAF World Indoor Tour, will be staged in the Reggie Lewis Track and Athletic Center Arena on February 14. In October, Bromell signed a contract with New Balance, and the New Balance Indoor Grand Prix is expected to be his first major competition as a pro over 60m. Defar, in her first indoor meet since February 2013, will run the 5000m and Martinez the 1500m or mile. Now in its 21st year, the New Balance Indoor Grand Prix has played host to eight world records and 13 American records. Jamaican world 4x400m relay medalist Edino Steele is in full training for the Olympic season, but first he wants to qualify for the World Indoors in Portland. He was in excellent shape two years ago in Sopot with the aim of making the podium, but got disqualified in his semi-final. Last year he went through a tough time but was supported by coach Glen Mills and Racers TC and was able to restart his training regime at the right time. During Christmas in training he was able to run 1:17 in sneakers over 600m. “Yes I’m back, thanks to all who supported me and apologize to all for my behaviour last summer. Now I’m full of motivation and energy to fight for the best possible,” said Steele. The Olympic Games is the top aim on his agenda but one of his goals for the summer is also to dip under 45 seconds. His best from last year is 45.19, indoors from 2014 is 46.11.